My bottle acclimates to its Midwestern surroundings. Happy New Year, nosy readers! I wish you a 2012 filled with new smell discoveries as well as familiar or forgotten scents that make you swell with emotion. I drained a full sample of Sweet Redemption for my parents' annual holiday party, and people seemed more eager to hug me than usual (they lingered due to my fragrance rather than their scotch intake). 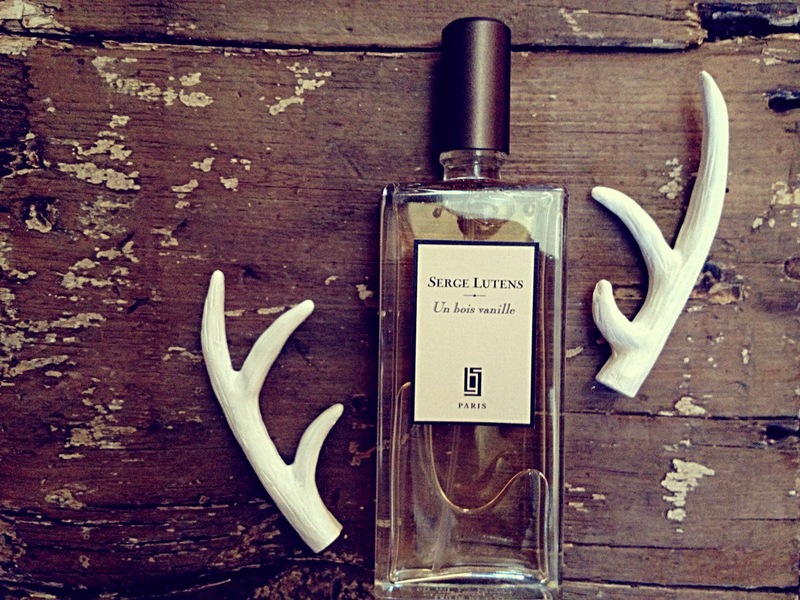 I was so happy to unwrap a bottle (pictured above) of Un Bois Vanille (the ideal fragrance to spray on your wool scarf, and I agree it's perfect for layering) and a bundle of beautiful beeswax candles. Both will go a long way towards making the bitter Boston winter warm. Alterra Coffee! I visited the main roasting facility on Humboldt, and wanted to set up permanent shop at one of the tables, eating pie, breathing in toasty beans, and talking all day with old friends. A friend had a Mrs. Meyer's Iowa Pine candle going in her bathroom, and I was teased for emerging from the bathroom more than once exclaiming how great it smelled in there. The candle seems to be sold out all over, but I'll be keeping an eye for one out next winter. Oh man, if you're ever in Iowa, do yourself a favor and purchase some AE French Onion dip. You may be thinking, I've tried french onion dip in a tub before, and it's not that great. I agree! It usually isn't, but this stuff is so delicious that dipping your chip so deep that your hand comes out creamy is one of my family's most sacred holiday traditions. Viva Midwest! Mrs. Meyers makes candles?? Oh my. Happy new year and congrats on your new UBV! Yes, and they are so cheap! ($6.99 for the Iowa Pine!). I will purchase the Geranium for sure when I'm next at Ace/TAGS (that hardware store has to be one thing Boston has on Denver). I may have a pine problem, Elisa. There was another pine candle (a wickless candle, but one that doesn't melt--kind of like a wax puck I guess--the first I've seen of its kind) from a beloved local pancake house (spelled Haus, if you want to know the truth)/shopping village (shoppeing isn't a verb) going at the same time, so I can't be sure if it was the combination, or the season, or the wine, but this bathroom smelled like a holiday forest. (And pine cleaner/freshener can be so gross, as I'm sure you've experienced, so it's somehow extra-delightful to smell a good one). I read about your new gigantor-bottle of Y--what a find! Any other holiday scent-excitement? I love the geranium scent -- I buy the geranium hand soap and household (haushold) cleaner in bulk. That's not a bad problem to have. For xmas I got a bottle of Tuscany per Donna (also quite, though not as, huge, so I'd be happy to share either), and John got me The Little Book of Perfumes, which I didn't even know he knew existed. Haushold, ha! The geranium Mrs. Meyer's has led to a dramatic increase in my willingness to do dishes; if they ever stop making it, L is screwed. I'm headed downtown to pick up some decanting supplies this weekend, so maybe we can do a little sample swap! I'm feeling guilty about how little of my Jeux de Peau I've used, and would like to share. That John is a treasure! I'm happy to do a sample/decant swap anytime. Let me know!! AE French Onion is the only French Onion. No other dips will ever compare. Also, while you're loving pine, please try the Anchor Steam Christmas Beer while it's still around. Pure, delicious pine in a beer! Lindsay, thanks for the recommendation--I'll try to get my hands on that piney brew this weekend! And I'd love to nosy interview you, if you're up for it.